With nearly 1 in 5 kids in America struggling with hunger, it has never been more important to increase access to feeding programs that can help kids connect with the food they need to thrive. For the last two years, this blogging community has shown its support for Share Our Strength, always raising more money than the year before. This year, Bloggers without Borders is working in partnership with Share Our Strength’s Great American Bake Sale & Gaby Dalkin on this year’s National Food Blogger Bake Sale! Last year they raised $25,000 through 26 bake sales. This year, they have set a challenge: to raise $50,000! 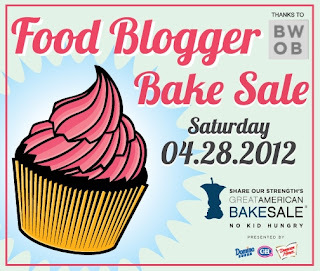 The first step in hosting a bake sale is registering at www.GreatAmericanBakeSale.org/signup. Registering will get you access to online fundraising tools and they’ll send you a poster and informational booklet. Additional tools and resources can be found in The Bake Sale Resources Center. They’ve got top 10 tips for your bake sale, flyers, stickers, pricing tips and much more! **All information was provided by the PR firm. For sharing this event with my readers, I will receive a 9" Little Miss Muffin doll.